Whether the aircraft is all yours, or in a partnership - two people or a club - SEL or MEL - reciprocating or turbine - this tool is for you. When is that engine due for an oil change? You'll quickly find out in if you Track Expenses Like a PRO. 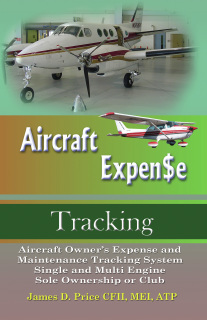 It's designed to help aircraft owners keep an accurate record of expenses, by simplifying your efforts. In addition, you can easily keep a running total of maintenance and navigation costs, breaking down business and charity flight hours and their operating costs. 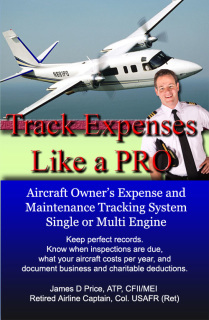 It does not replace FAA required logbooks, but it sure makes your life easier. This cost based accounting system has reminders for Instrument, Avionics, Engine and Airframe repairs, ADs and SBs. 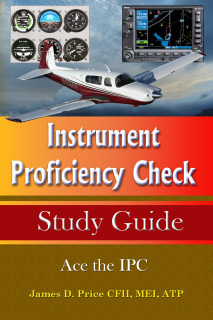 Whether you're extremely instrument and ATC structure proficient, or need to dust off the cobwebs from the attitude indicator, this book is a must. 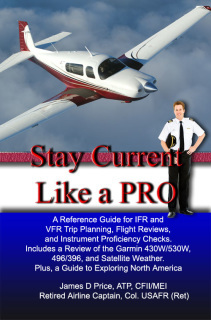 It's packed with concise sentences and simple graphics to help you maintain knowledge of FAA Regulations, weather reports and forecasts, IFR charts, and the airspace system. Flight planning, takeoff, departures, holding, STARs, and all the approaches are thoroughly covered, including IFR emergency situations. It literally covers everything from flight planning through landing. 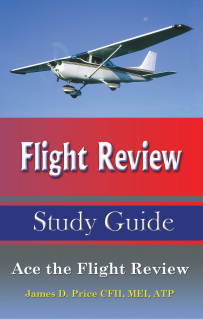 Additionally, as an added bonus, this book thoroughly reviews the nuances of flying with a GPS and WAAS. There are references throughout to additional short courses offered by AOPA, NASA, and FAA Safety, to help sharpen your instrument flying skills and enhance your aeronautical knowledge. He is a veteran of the Vietnam War (C-7A Caribou) and the first Gulf War's Desert Shield and Desert Storm (C-130E). He was an airline pilot for Saudia, Hughes Air West, Republic Airlines and Northwest Airlines (now Delta). After twenty-seven years and 22,000 hours, he retired in late 2005. During his airline career, he has served as a Check Flight Engineer (Instructor) on the Boeing 707 / 720 and the B-727. He was a Captain on the Douglas DC-9, Airbus A-320 and Boeing 757. He and his wife Gerry own a Mooney M20K 252.